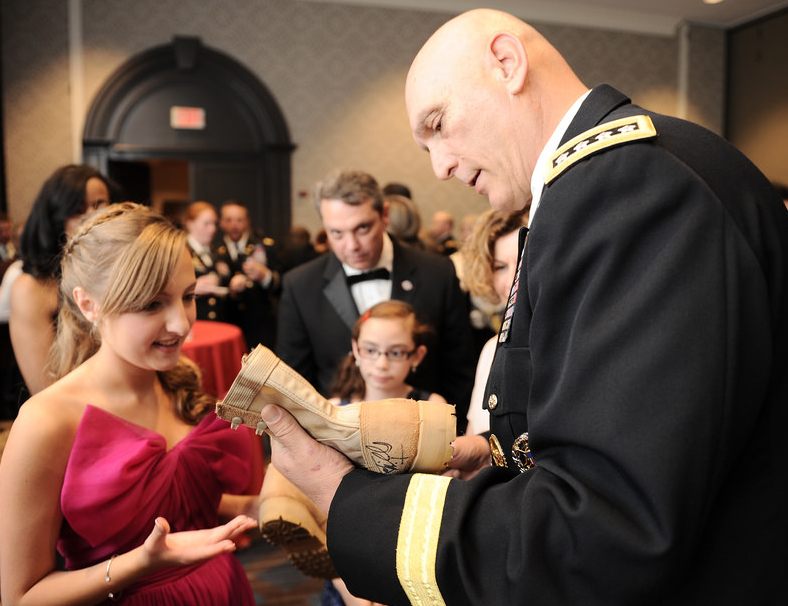 Chief of Staff of the Army Ray Odierno autographs a boot for Kenzie Hall. Sixteen-year-old Kenzie Hall knows the stress military kids feel when a parent deploys to a combat zone. She also knows what it's like to experience constant change. Kenzie has moved more than 10 times, and at one point, she attended three schools in one year. With the help of her mother, Aerica, she formed “Brat Pack 11,” a foundation dedicated to supporting the children of military heroes by providing them with unforgettable experiences and connecting them with a network of support, ﻿(Tweet: @Brat_Pack11)﻿. Her compassion and tirelessness effort got her nominated and selected for the 2014 Army Military Child of the Year, (MCOY). She was presented with the award April 10 along with a laptop and a $5,000 cash prize. "To be selected as Military Child of The Year was hands down one of the most humbling things I have ever gotten to experience," said Kenzie. " Not only did I get to share with others about my program, Brat Pack 11, but I had the chance to hear other military kid’s stories as well. It’s an experience I cannot put into words. It was just amazing to be able to see what other teens are accomplishing around our country." Dena Yllescas-Johnston whose husband Capt. Robert Yllescas died in 2008 from wounds he received in Afghanistan, recommended Kenzie to the MCOY selection committee. Yllescas-Johnston's daughters were the first recipients to have their dream come true from Kenzie’s foundation, which reached out to Yllescas-Johnston to see what the foundation could do for her two little girls. www.Bootcampaign.com, picked up Brat Pack 11 as the cornerstone for its children’s program. June Morse with Operation Home Front that sponsors the MCOY event, said Kenzie’s family is her rock. “Jason and Aerica have built a very strong family foundation for their girls,” she said. “These are two girls are willing to try anything. I think their parents installed wings because they have dreams and they find ways to live them." Kenzie and her 11-year-old sister Madison have continued to represent military kids in the community. They were selected as the Army children at a June San Diego Padres “Military Kids Appreciation” night alongside children from other services. Following the ceremony on the mound, Kenzie did an interview with a local television station. ﻿http://m.mlb.com/sd/video/topic/20153070/v34166707/arisd-telecast-talks-to-f﻿ounder-of-bratpack-charity/?c_id=sd. 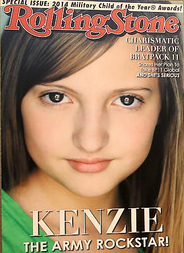 "I'm really excited to see how Brat Pack 11 will keep growing," said Kenzie. "BP11 is something I know can change so many lives and I always want to be a part of that.! Brat Pack 11 has become a program under a National Non-Profit www.Bootcampaign.com and I cannot wait to share with you all of the wishes and stories of some amazing military kids." Kenzie Hall's face is featured on a poster depicting the cover of a Rolling Stone magazine. Every year the magazine honors the military children of the year from all the branches by featuring their face on a poster. 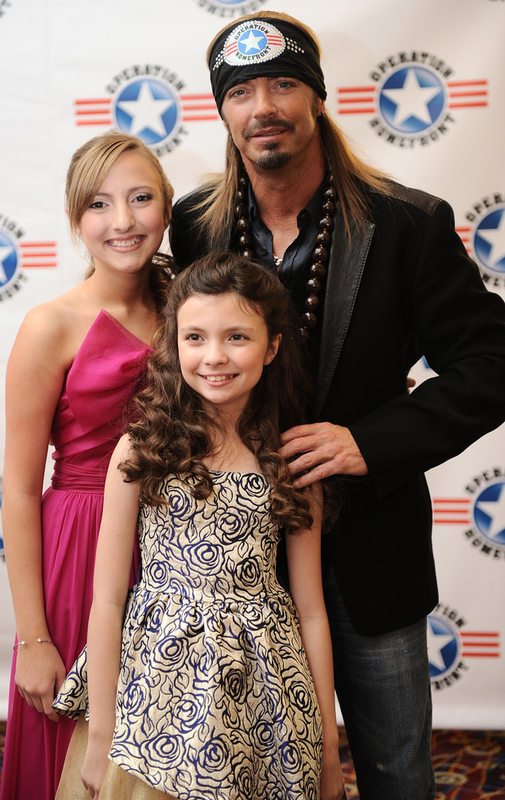 Kenzie Hall and her sister Madison Hall with singer Bret Michaels at the Military Child of the Year ceremony in April. Michaels comes from a military family and is involved in military charities. Chairman of the Joint Chiefs of Staff Gen. Martin Dempsey was on hand for the Military Children of the Year awards ceremony April 10. 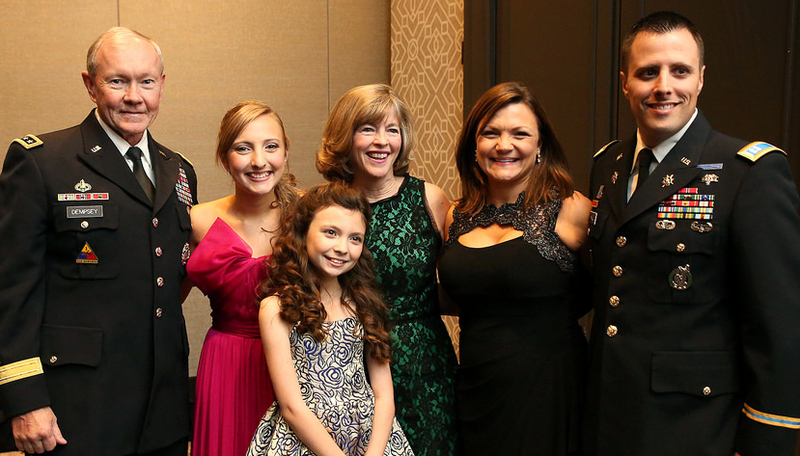 Left to right: Gen. Dempsey, Kenzie Hall, Madison Hall, Mrs. Dempsey, Aerica Hall, and Capt. Jason Hall.